Part 1 of Problems in the “Apps-Mosphere” addresses the issue with app development. Part 2 discusses ways companies can avert these obstacles. It’s quite difficult to fathom that less than 7 years ago, mobile apps did not exist. Better yet, the notion of a mobile browser was of little significance. Flip phones like the Motorola Razr were still the cool thing to have, and cameras that took pixelated, low-resolution images were considered a marvel of innovation. Fast forward to the end of 2012, 5 years after the first generation iPhone (read about iOS 6.1) and Android devices came to market. But this number alone doesn’t tell the entire tale. Powering through lines and lines of code that ultimately reach the hands of users is not by any means an easy task. 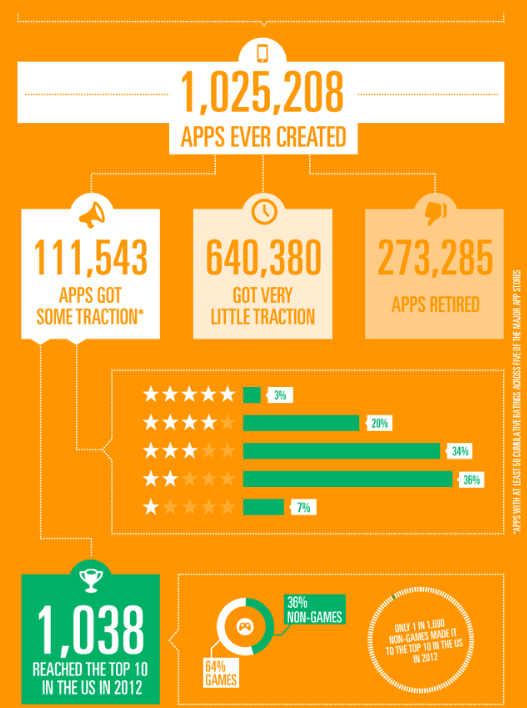 The competition is fierce, and the reality is undeniable – of these 1,025,208 apps ever created, 111,543 were successful. To put this into perspective, that’s a mere 10.88%. So about 1 in 9 apps garner any interest whatsoever, and the rest gain little to no traction and ultimately become inactive. This is not a promising statistic for any developer, although beating the odds with a valuable product offering is still possible. The problem with apps is that their market has become saturated over the years, to the point that many variations of the same product are offered in the app store. With each passing year, more apps are created; about 33,000 more apps were developed in 2012 than in 2011, at a count of nearly 340,000. In other words, the app market expanded by 49% in just a year. In conjunction with these numbers, we’ve only seen a 10% increase in smartphone ownership from 2011 to 2012. The rate of smartphone ownership growth does not account for the exponential growth we are seeing in the “apps-mosphere,” and that is certainly indicative of a fiercely competitive market. However, this isn’t to say that app creation is a fruitless endeavor – apps unarguably make our lives efficient albeit more entertaining. Games, task lists, photo editors, and the list goes on indefinitely – the open ended competition in the “apps-mosphere” facilitates a sort of natural selection process that distinguishes valuable apps from inferior ones. But if app development is not necessary for success – that is, if companies (namely publishers) are looking into apps to supplement their business as opposed to designate them as a keystone for survival, then it might not be a viable decision. Specifically for those in the publishing industry where app development can be avoided entirely, do the benefits reaped from app development account for such high opportunity and financial costs? Perhaps the mobile browser is simply a better, low-cost alternative that, with the advent of HTML 5, will reap publishers more benefit in the long run. Stay tuned for Part 2, where we discuss the power of the mobile browser as an alternative to app development in further detail. What are you thoughts on tablet browsing as opposed to in-app usage? Let us know on Facebook and Twitter, and don’t forget to follow/like our pages to stay in the loop with company musings, industry updates, and much, much more.